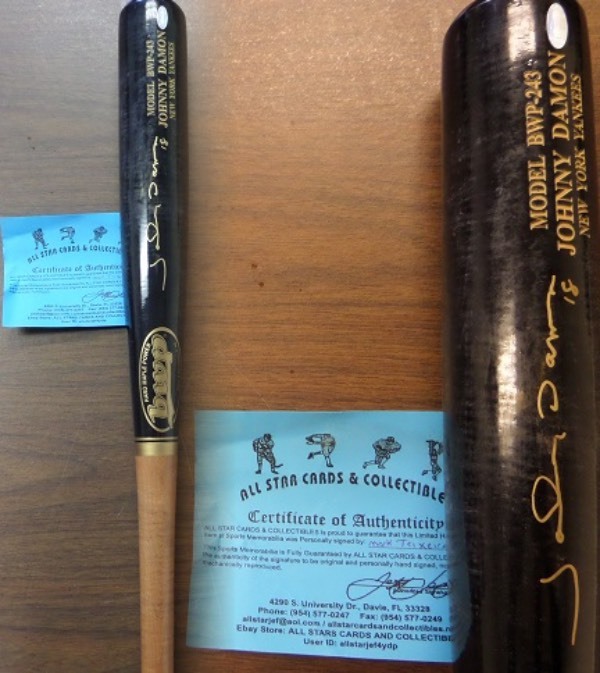 Coach's Corner - Johnny Damon Red Sox Yankees hand signed "Steiner" BB bat. Go Back to Lot List Johnny Damon Red Sox Yankees hand signed "Steiner" BB bat. This mint 2-tone bat is gorgeous, and his model BWP-243 from BWP. It is stunning in black and brown colors, has his name engraved as well, and comes barrel signed perfectly in gold paint pen. It is a 10 all day long, a terrific Boston or NY display bat, and has the Steiner lifetime hologramm affixed on the barrel for iron clad certainty.